A good friend of mine asked me the other day whether I’d ever made carrots with ginger before. I thought about that question and my short answer was that I had, but then I couldn’t remember the last time I’d made them. I started to realize that I rarely make carrots as their own side dish, mainly because The Husband doesn’t really like carrots. He’ll eat them, but he doesn’t enjoy them and that’s really saying something because he is the least picky eater on the planet! So as my friend and I were talking, I started thinking the sweet potatoes that I recently roasted in coconut oil. 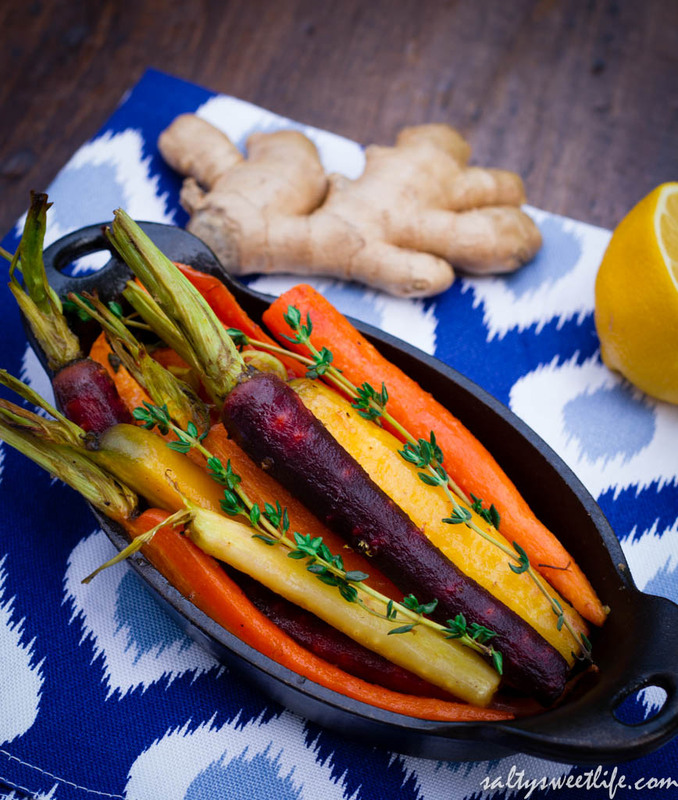 This, in turn had me daydreaming about how amazing carrots would taste alongside those sweet potatoes, roasted in coconut oil and glazed with maple syrup and ginger! I was instantly obsessed with the thought and went straight to the grocery store after work for carrots and ginger! I came home and within minutes I was enjoying possibly the easiest and best recipe I’d made in a long time! Roasting the vegetables in coconut oil brought out the natural sweetness of the root vegetables and cloaked them in a mild, coconut-ty flavor, while the ginger-maple syrup glaze took them right over the top and made them sinfully delicious! My mother happened to pop by right around the time I was pulling them out of the oven and she loved them so much that she asked me if she could take them home for her dinner. Since I could not possibly refuse such a request from my mother and because I knew I could easily whip up another batch in mere minutes, I waved goodbye to my new favorite treat and immediately started making more. Less than a half hour later, The Husband and I were eating that second batch with our dinner! I am pleased to say that he ate them all and was looking for more! I think I’ve converted him into a carrot fan! I am not sure why it’s taken me so long to cook with coconut oil. My mom has been using it for well over a year, but I’ve always been a tried and true olive oil girl. 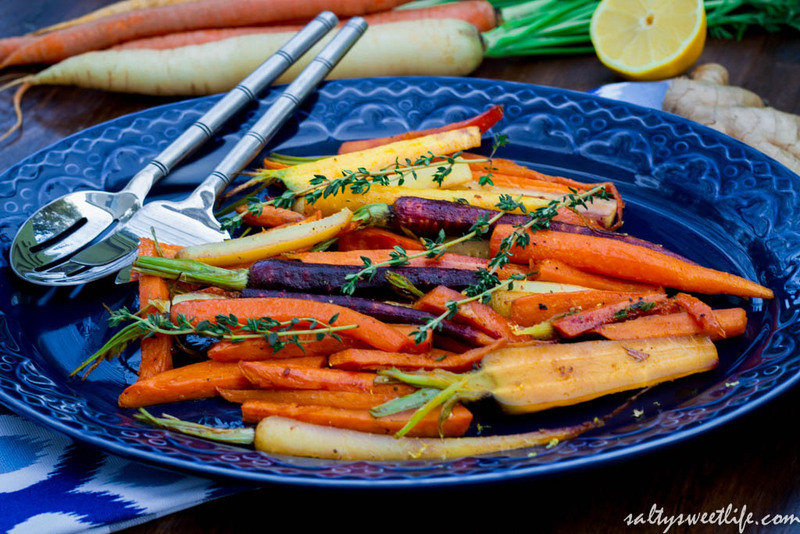 I’ve since discovered that coconut oil adds a mild, slightly sweet coconut flavor to the food and after using it to roast these root vegetables, I don’t know if I’ll ever eat them any other way! I used Trader Joe’s Organic Virgin Coconut Oil. If you’ve never used coconut oil before, I hope you’ll give it a try–they really make this dish. Know that it’s solid at room temperature, but it melts very quickly. The carrots I found ranged from small and thin to large and thick. I simply cut the larger ones into eighths to make them more manageable. 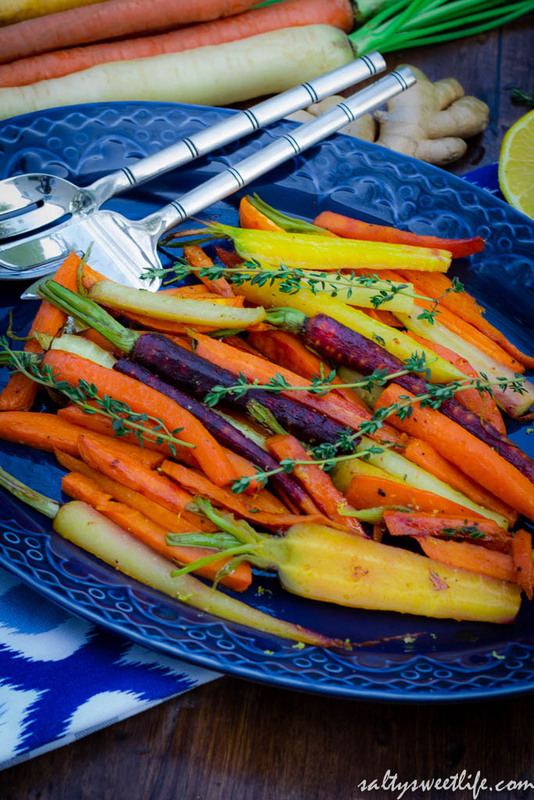 I used organic rainbow carrots, which I affectionately call “Blogger Carrots”. They are not only beautiful to look at, but each color has a slightly different flavor as well. Regular carrots will also work just fine! With a vegetable peeler, peel the carrots and sweet potato, then cut them into 1/2 inch by 4 inch sticks. Scatter the sweet potatoes and carrots on a large baking sheet and sprinkle with a four-finger pinch of salt and freshly ground black pepper. Dot the vegetables with the coconut oil and place into the oven. The oil will melt after about a minute or two in the oven. Gently toss the vegetables in the melted oil to coat them and place back into the oven. Cook for 20 minutes. While the vegetables are roasting, stir together the maple syrup, grated ginger, thyme, lemon zest and lemon juice in a small bowl. Try not to eat it all before the veggies finish cooking! Seriously, it’s that good. At the 20 minute mark, pour the maple syrup mixture over the vegetables and toss to coat. 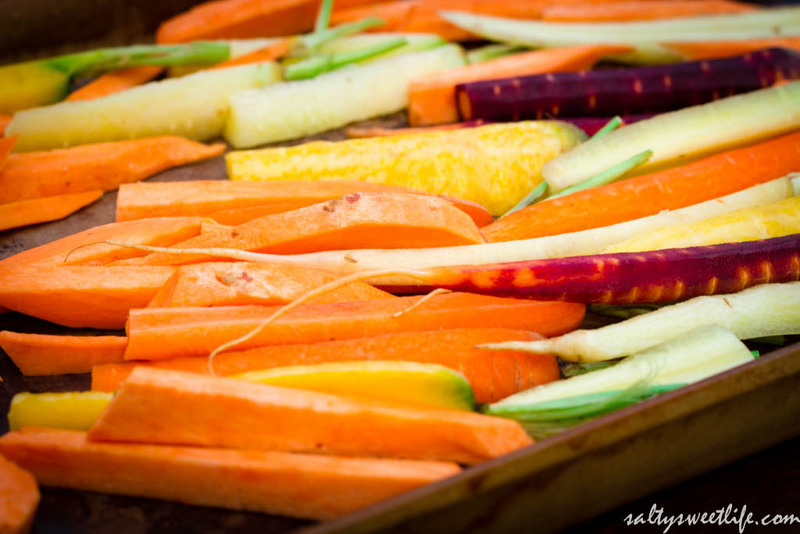 Put the vegetables back into the oven and roast for an additional 5 minutes or until the vegetables are tender. Garnish with fresh thyme leaves and extra lemon zest, if desired. Congrats on converting your husband to a carrot fan! It’s a tallllll order, but I would be ecstatic if I could convince my boyfriend to enjoy tomatoes and mushrooms. Maybe someday! Thank you Alyssa!! Please do share what you’ve been baking with the coconut oil! Do you use it in place of butter? I think pancakes would be so good with coconut oil on the griddle instead of butter! Good luck on converting the boyfriend–that’s going to be a tough one! Next conversion on the list: grapefruit! Those look stunning! What great colors. May I have your acceptance to review this on my twitter? Hi Brett! Sorry it has taken me so long to see your comment, it was put into the spam filter. Thank you for asking, and yes, that would be lovely. Thank you! Spectacular! And thanks for the coconut oil tip. I’ve been largely avoiding the trend since I love olive oil, but I’m going to pick up a bottle when I make my weekly TJ’s run on Saturday and give it a try. If it’s a part of carrots that look like that, then its a winner in my book. I have missed you!! And now I know why you’ve been missing for so long! Holy landscape project! Yes, the coconut oil is pretty amazing, plus, if you get some on your hands while cooking, you can smear it on your face for a dewy glow! 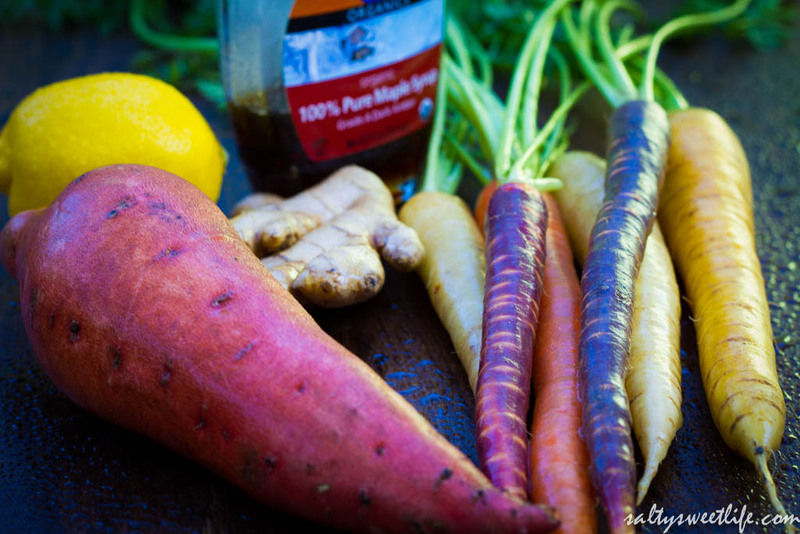 I made another batch of these last night with only sweet potatoes–so delicious! These will probably end up on the Thanksgiving menu! Hattie–I’m sorry that your comment didn’t show up! I am just now finding this comment of your in the spam filter! Thanks for reading! Previous PostOscar-worthy Cocktails and Nosh!